And Once Again: Napa Model Michele Ouellet Stuns In Vogue! Um, remember when we made that little prediction that Napa Valley-born model Michele Ouellet was about to blow up in 2012? Well, we're sitting here dusting off our shoulders a little bit after spotting the beauty in the February issue of Vogue. 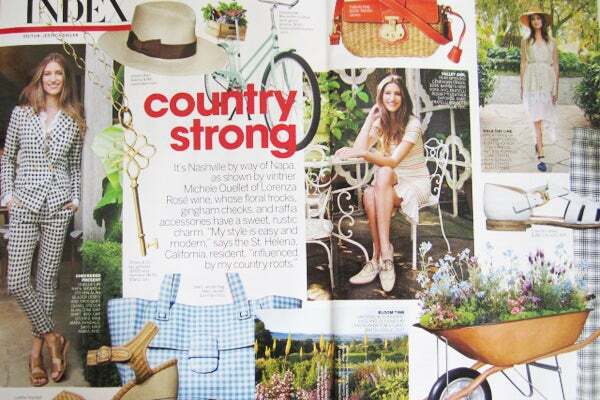 Shot by fellow St. Helena resident (now NYC-based photographer) Claiborne Swanson, Miss Ouellet (who also runs the Lorenza Rosé wine company with her mama) is sitting pretty in the Index pages of the glossy in a rustic-, Northern Cali-inspired "Country Strong" feature. Picnic-worthy plaids (including a killer Steven Alan suit that's immediately found its way onto our want-list), comfy, hill-savvy flats, a swoon-inducing mint-hued bike, and straw accessories abound. Naturally, it's all making us want to book a Napa-bound vacation, stat! Oh, and another fun fact: We're apparently not the only ones that think Ouellet is a dead ringer for J.Crew's visionary leader Jenna Lyons. Ouellet tells us that the folks on the Madewell set actually refer to her as Lil' Jenna. Awwwww. To find out more about the skyrocketing stunner, check out our lush profile of Ouellet !